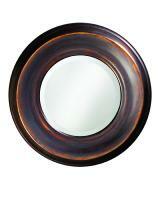 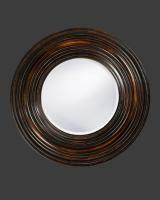 This small round mirror is bordered by a bold copper tone frame. Frame is made from resin and burnishing gives it the appearance of fine old age. The mirror measures 33 inches in diameter with the frame and 19 inches on its own, making it a functional piece, but not quiet big enough for a full bathroom vanity location. 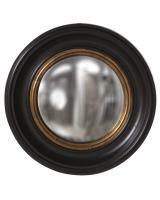 At only 18 pounds in weight, the mirror is relatively light and you should be able to mount it without much hassle on just about any type of wall. 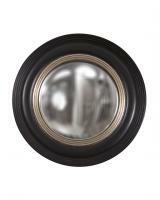 Comes with brackets and ships for free to many locations.